Russian opposition activist Sergei Udaltsov. 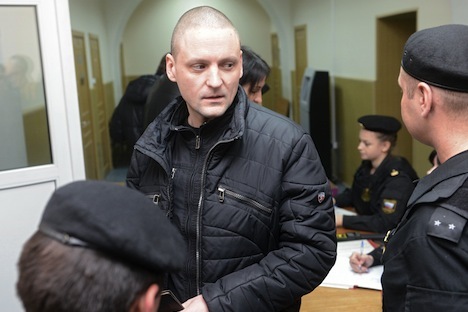 The Rasskazovsky district court in the Tambov region has refused to parole opposition activist Sergei Udaltsov, his lawyer Violetta Volkova said. "Sergei Udaltsov denied parole: three unexpunged reprimands, two punitive confinements and three conversations do not prove that he has mended his ways," Volkova wrote on her Twitter account. Interfax has no official confirmation of the report. On July 24, 2014, the Moscow City Court sentenced Udaltsov and Leonid Razvozzhayev to four and a half years in prison each on charges of masterminding mass riots and preparing more riots in Russian territory. Udaltsov is serving his term in a penal colony in the Tambov region.